Eat well, live well, and be merry! 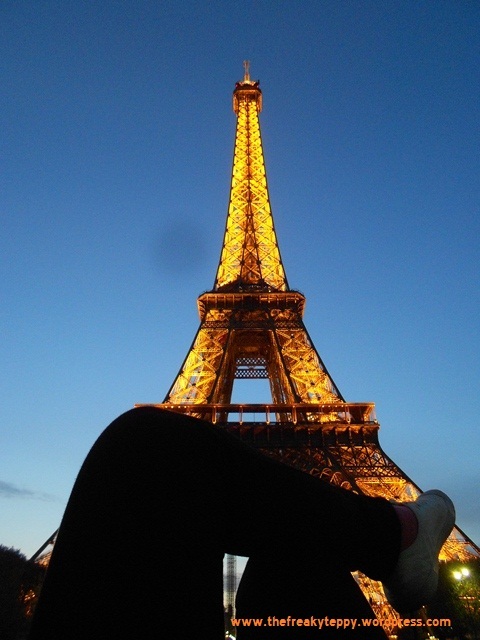 So there ya go… I laid down on the park in front Eiffel and chilled… LIKE. A . BOSS. The second one was that I finally got to see Versailles Palace! It is sooo huge you won’t finish seeing everything in one day. So I just chose the main thing I wanted to see: the palace itself (or as the French call it, “Château de Versailles“). I skipped wandering around their beautiful garden, saving it for next time. This palace is located in Versailles, about 20 km southwest from Paris. I came here on Monday and even on weekdays the line was CRAAAZY! Gaaah! So yah, I’m giving you a heads up. The entrance ticket to the palace is about 15 Euro. It’s better if you buy it online here. So what about it then? The palace is extremely gorgeous and just… huge. You can see how grand the lives of those royals were, my God. How much money can one have, really?! I thought to myself why the hell would anyone build something this grand and artsy and complicated, I bet all of those royals must not have anything to do at all but they had loads of cash. So they just built, built, and built… et voila! A state of the art Palace complex bigger than Vatican City. Reblogged this on Letters from Josephine. kereeen!!! berasa kaya balik ke jaman dulu ga sih, pas lu di dalem tepp? Teppy, 15 euro itu udah boleh masuk ke seluruh tempat nya kan? Nggak cuma bbrp bagian tertentu trus ntar kalo masuk ruangan2 tertentu mesti bayar lagi? Someday..soon..I’ll be there too teh!amiiin! This entry was posted on June 25, 2013 by Teppy in Bucket List, Euro Trip, International, Jalan-Jalan, Rekomendasi, Seru-seruan, Traveling and tagged Bucket List, Chateu de Versailles, Eiffel, Eiffel Tower, France, Jalan-Jalan, Paris, Versailles, Versailles Palace. Check out my previous posts on these dates! Belajar Berkuda di APM Equestrian Centre! Bagi-Bagi Tips Blogging di Blogger Gathering-nya BukaLapak! BOOK PROJECT with @bentangpustaka: I Need Your Help!